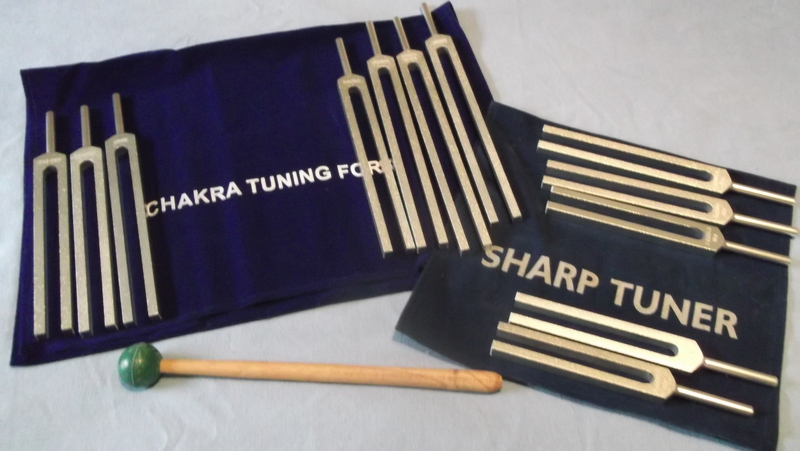 The Song of the Spine tuning fork set consists of the 7 piece Chakra set and the 5 piece Sharps set that were created with special frequencies not currently available on the market. These frequencies were by Dr. June Leslie Wieder, a Doctor of Chiropracty and an instructor of medical massage in California. 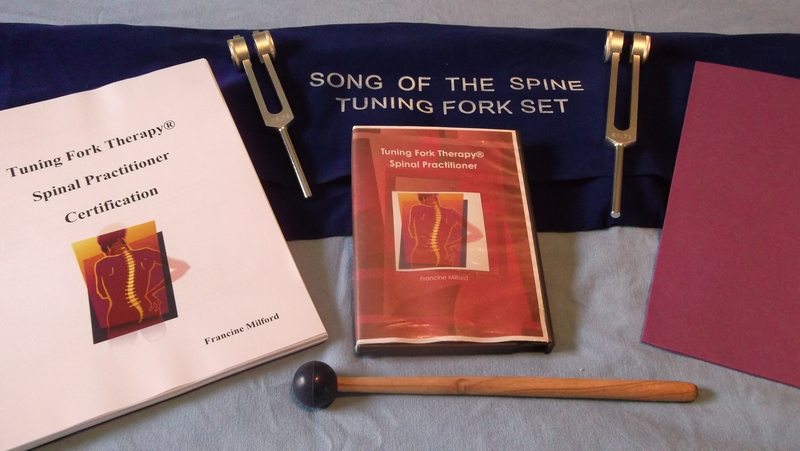 While in her book, The Song of the Spine, Dr. Wieder guides readers to use the tuning forks directly on the spine, I do not encourage this practice. For many reasons, I prefer to use the forks on either side of the vertebrae. The 12 piece weighted tuning fork set comes with extra long handles to make holding the tuning forks much easier for you. These forks are made from aluminum alloy and with proper care should last you a lifetime. Cost of weighted tuning for set is: $269.99 plus $13.99 U.S. postage. Call for postage charges to your country. PLEASE CONTACT ME FIRST BEFORE ORDERING IF YOU LIVE OUTSIDE OF THE UNITED STATES. 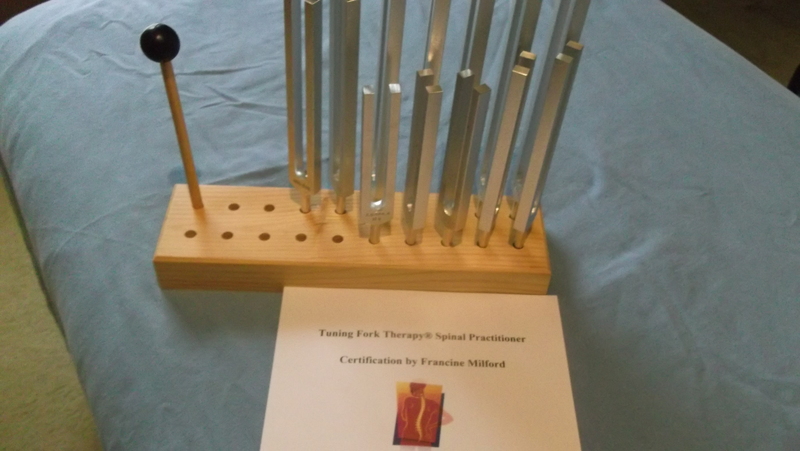 Become a Tuning Fork Therapy® Spinal Practitioner. Your certification will include tuning forks, manual, activator (mallet), Instruction DVD, and special easy to follow chart. Cost of Certification is $399 plus $13.99 U.S. Postage. Call for postage to your country. Your certification will include the UNWEIGHTED 7 piece Chakra + 5 piece Sharp set, manual, activator (mallet), Instructional DVD, and special easy to follow chart. Cost of Certification is $299 plus $13.99 U.S. Postage. Call for postage to your country. Cost: $299 plus $68 postage. Cost of 5pc Sharp Set is $79.99 plus $11.99 postage in U.S.A. Your certification will include the unweighted 7 piece Chakra and 5 piece Sharp tuning forks, manual, activator (mallet), Instructional DVD, and an easy to follow chart. Cost of Certification is $329.99 plus $13.99 U.S. Postage. Call for postage to your country. This set includes the 7 basic frequencies that correspond to the 7 major chakras of the body. All frequencies and Chakra names are stamped on the tuning forks. You can use these forks on the points along the spinal column. Cost: $169.99 plus $13.99 postage inside of the U.S. Cost for BOTH sets purchased together is $169.99 plus $13.99 postage in U.S.